Scarborough junior Jarett Flaker of Scarborough had a strong day at the Boston University John Thomas Terrier Classic breaking his own state records at 200m & 400m. Flaker who entered the meet with a 50.09 best for 400m in the 2018-19 season ran in lane 5 in section 9. He opened strongly taking the lead at the break and crossing through the 200m mark in 23.1. Flaker controlled the race to the end as he held off a strong challenge from Marcus Manson of Boston College stopping the clock at 48.73. The mark erased his own state record of 49.24 run at New Balance Nationals a year ago. In the process he broke the state junior all time best of 49.54, and qualified for the championship 400m section at New Balance Nationals. Flaker ranks 4th nationally for the class of 2020 in the event, & 17th overall. In the 200m race he once again was in section 9 and in lane 5. 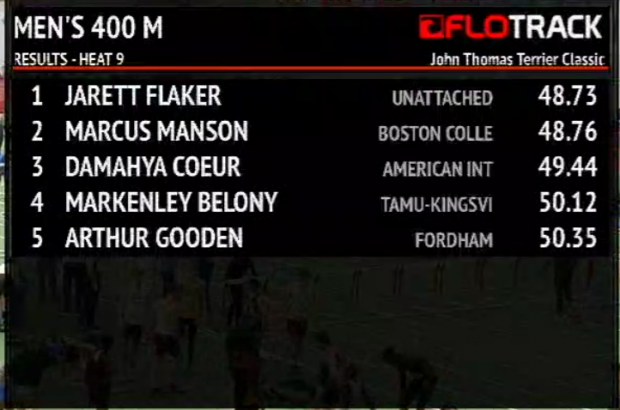 Flaker took advantage of the lane draw as he burst out to the lead after a strong first 50 meters. He navigated the steep bank in lane 5 with ease and came off the turn with great momentum crossing the line first to win the heat. The time improved his personal best 22.14 he clocked back in December on the same track. The mark was the first time a Maine high school athlete has been under 22 seconds indoors, and is just .04 off Isaiah Harris's outdoor 200m record. Flaker's mark qualifies him for the New Balance Nationals championship race, and currently ranks 22nd in the event nationally and 8th for the class of 2020.